GU: Tonight, I am very pleased to be talking to Ultrain co-founder & CEO Guo. I met Guo during an event in Shanghai in early 2018, who told me about Ultrain. At that time, the blockchain industry was crowded with various projects, but Mr. Guo’s understanding of blockchain technology and the architectural design of Ultrain left me with a great impression. More than a year has passed, and many projects have been short-lived, but I am very pleased that Ultrain has developed steadily. Not only did they reach every milestone in a convincing manner, but also have substantial applications in commercial fields — the progress of successful adoption. 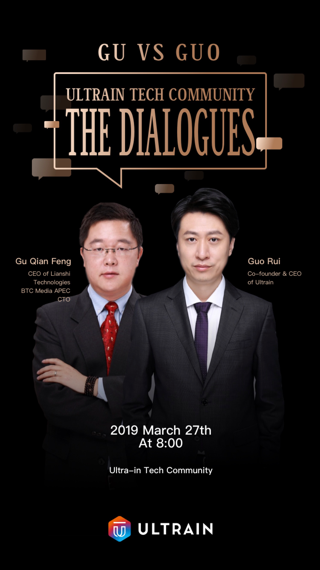 As a blockchain technician myself, I feel privileged to be discussing some of the technical aspects of Ultrain with Mr. Guo, as well as asking questions about commercial issues facing blockchain. GUO: Thank you Gu, for your continuous support of Ultrain. GU: The first question: amongst other public chains that use VRF, such as Algorand and Dfinity, how does Ultrain differentiate itself? Do you have your own unique characteristics? GUO: As we all know, the core technical component of blockchain technology is the consensus mechanism. Let’s start by discussing consensus and let everyone have a preliminary understanding on the technical level. When compared with Algorand and Dfinity, I think that we are all trying to solve the same problem. That is, to achieve performance capable of commercial practices, while ensuring safety, security and complete decentralization. However, please note that high TPS is not the only indicator here, but also confirmation time. A transaction needs to be confirmed quickly. We can find that there are many public chains out there with impressive TPS, but with confirmation times of about 10 minutes. Imagine a user visiting a web page and it taking 10 minutes to load. This is a business scenario that is difficult for users to accept. I think there are two different approaches to achieving security, decentralization and high TPS. One, similar to Algorand, is the “confirm first, then produce” approach which is based on VRF & BFT algorithm; another approach, similar In Dfinity, is the “block is first confirmed” approach, based on BLS & VRF. These two methods have their own advantages and disadvantages. From a commercial point of view, we chose VRF+BFT. The random selection of each member of the Algorand Consensus Committee is probabilistic. The number of members selected during each round of the committee also changes, which brings about the possibility of multiple network storm problems of the proposer, and the bandwidth consumption of the node itself is high. In the case of Ultrain, the number of members is fixed in our consensus mechanism, RPOS, which effectively solves this problem. Algorand’s consensus does not involve incentives. It assumes that 2/3 of the machines are owned by good actors without malicious intent. Those strict conditions must be met, but no reasonable incentive mechanism is in place to ensure this. Ultrain’s RPOS has a complete incentive mechanism design. Ultrain introduces a complete fragmentation mechanism for computing and storage. Our fragmentation architecture has been launched and is under continuous testing. It is expected to be launched in mid to late April. Ultrain’s improvements to communication between shards, and the feature of random scheduling of mining rigs between shards has realized the linear expansion capability of the network’s resources, while fully guaranteeing security, ensuring the function of our business model. These features are not currently available on Algorand. We have just completed an update to our Technical Yellow Paper, including consensus and multi-chain architecture. You can download our latest technical yellow book at https://ultrain.io/paper to learn more about our technical details. GU: Second question: In the scenario of commercial applications and assuming I am a company that intends to transform its existing business with blockchain -how long does this process take? GUO: First, we can provide different levels of service depending on the depth of the enterprise’s application of blockchain. If the company is familiar with blockchain technology, has designed its own blockchain business model, and has its own technical team, then our official website has a SDK, technical documentation and integrated development environment, along with complete DApp development examples, which customers with a strong technical foundation can use. We provide technical support under that approach. If the company already has a complete blockchain business model design, but lacks technical capabilities, our third-party partners can provide blockchain technology services to help enterprises with development. If the company only has a preliminary understanding of blockchain technology and believe that blockchain can be a solution, but is not clear of how to do it, Ultrain also provides blockchain business model consulting services to provide enterprises with innovative business models. We are creating a one-stop service for clients. GUO: Actually, we see the first type of client pretty often. Many enterprises already deeply understand blockchain technology and its business model. What is lacking is a suitable public chain. GU: The third question, zero-knowledge is one of the key highlights of Ultrain. Can you elaborate on Ultrain’s zero-knowledge proof scheme, and how to use it for privacy protection? GUO: Ultrain’s zero-knowledge proof component allows contract developers to protect their data even in simple contract-level development. Technically, it can support arbitrary data, and proofs of arbitrary logic, including model integration with machine learning. For example, models like CNN complexity are supported with our zero-knowledge proofs. From the business point of view, various business scenarios, such as anonymity of sensitive case data, anonymity of insurance customer information data, anonymity of customer information in the supply chain, anonymously auctioned goods, anonymous voting, valuation of used cars, fund transactions, etc., can all be supported. In actual use, contract developers directly call the underlying zero-knowledge proof method via API, which of course consumes a certain amount of UGAS for payment of service fees. In order to support developers, we will provide a series of examples for ease of use purposes. Users can modify based on their own scenario requirements. At present, these priorities are used by enterprise developers. You can contact us if you need those services. GU: Fourth question: Ultrain often speaks about the concept of trusted computing. How do you define the concept of trusted computing? What is the difference between trusted computing and smart contracts? GUO: Ultrain provides enterprises with an IT service that we call “trusted computing.” Trusted computing is based on blockchain technology, and is an integration of distributed scheduling technology, resource management technology, micro-service technology and other core technologies to form the next generation computing infrastructure. A completed innovative calculation mode. The core function of trusted computing is that after enterprise data enters the trusted computing platform, the data cannot be tampered with, cannot be destroyed, and is transparent to everyone, so you can naturally trust the data. For enterprises, the cost of using trusted computing is similar to that of cloud computing, which is to directly calculate the computing power as needed, without considering the server hardware cost, operation and maintenance cost, and resettlement cost. Since the core of trusted computing is blockchain technology, smart contracts are also a component of the trusted computing core technology stack. However, trusted computing is not only comprised of blockchain technology, but includes scheduling, resource management, micro-service technology, which is the difference between the two. GU: Fifth question: This is a follow up question. Based on trusted computing, what do you think are enterprise’s immediate needs? What are the advantages of trusted computing over smart contracts? What attracts companies to use Ultrain, rather than other public chains when choosing a blockchain service? GUO: The goal of a trust management solution is to help companies achieve more revenue. In essence, trusted computing provides enterprises with the ability to build low-cost trust, based on blockchain technology, to allow partners in the upstream and downstream of the enterprise to trust each other, thus making originally impossible business models possible. This is unthinkable in the traditional business society. Except for the four major state-owned banks, no other company had the ability to establish such trust. High performance: Our TPS is 3000, 150 times of Ethereum, with a confirmation time of 10 seconds, 1/12 of Ethereum. Zero-knowledge proof solution. We are the only public chain in the world that can provide zero-knowledge proof solutions on chain. GU: The sixth question: what is Ultrain’s target market? Can you give three examples? What do you think Ultrain can do for businesses in terms of business model improvement? The first is an example of a carbon emissions trading based on blockchain, and we are working with a Third Board listed company. The company’s main business is to provide biomass energy, which is to replace coal with wood mixture as a fuel replacement, which has been identified by China as a zero-carbon technology in the past few years. It can effectively save energy, reduce carbon emissions and protect the environment. In the process of energy supply, they can record carbon emissions saved and create carbon credits, which can be traded on the carbon emissions exchange, generating new income for the company. The problem with this new business model is that the boilers they use are too small, such as 6 tons, 8 tons, making it difficult to aggregate carbon savings to the required 500,000 tons of a credit. Therefore, they need to collect all the emission reductions of the boilers after combustion and carry out batch transactions to carbon emissions exchanges. But who is counting this data? If the company’s own system counts it, the carbon emissions exchange will not recognize the authenticity of the data, because the company itself may modify it. If you find third-party statistics, third parties may collude with the company, which is then not credible. According to the Carbon Emissions Exchange, it is difficult for the company to trust the exchange. In the traditional business scenario, this business model requires a very high cost of trust to be established. At this point, the zero-cost trust capability provided by blockchain technology can solve this problem well. Ultrain and the company have teamed up to develop a carbon blockchain solution. The company is equipped with an IoT device called a thermal mass spectrometer, which is used to record the number of boilers burned per day. Using wireless transmission technology, the heat data of combustion is directly written to the blockchain by the device, where it is stored. Through this data, it is easy to calculate the carbon emission reduction. Due to the immutable nature of the blockchain, parties involved in carbon emissions trading can determine that the data is true, effective and reliable, and the business model can be implemented. YOHO! it is the largest streetwear e-commerce trading platform in China. They launched a customer-to-customer sneaker trading platform, called UFO, earlier this year. After a buyer purchases sneaker, the seller sends the sneakers to the platform, where appraisers authenticate the shoes. After authenticity is determined, an anti-theft ID card is added to the shoes, and a tamperproof NFC chip is secured on the buckle. The shoe information and transaction data is uploaded to the Ultrain chain. After the buyer gets the shoe, the buyer can access the genuine information of the shoe with their mobile phone. Many of these limited-edition shoes are not worn after they are bought but will be traded again. Buyers can sell these sneakers on other platforms, such as Idle Fish. After the new buyer gets the shoes, you can download the YOHO! app to verify their authenticity and upload the new transaction. For buyers that want to trade the shoes again, there is significant incentive to do this, since it will preserve the shoe’s value. This is a free platform that saves market costs for goods and achieves better results through direct selling and blockchain. In the third case, let me introduce you to the decentralized board game that we cooperate with the Electric Soul Blockchain Laboratory — Unitopia. Online games’ core pain points is the fairness issue. Since the games are run on a server provided by the game developer, the game developer has the ability to control variables. For example, the order of the cards in poker greatly influence the outcome of the game. In online Texas Hold’em games, you will find that the chance of AA to KK in online games is much higher than that of offline games. In order to solve this pain point, Ultrain and Unitopia jointly developed a blockchain Texas Hold’em game. The biggest feature of the game is that the program logic of shuffling is not controlled in the original black box of a centralized server but is instead controlled in an intelligent contract on the blockchain. Because blockchain technology cannot be falsified, and is transparent to everyone, card order cannot be controlled by game developers, and is completely random. This is a complete solution to the core pain points of traditional online board games. I believe that all game users who understand this change will be more interested in decentralized board games. Through these three examples, you can find that although the actual application scenarios are very different, the core value of trusted computing is still providing low-cost trust. This is why we believe that blockchain technology can bring new businesses to the market. At the same time, we can see that this kind of trust ability can be applied to reduce costs, and applications of raising revenue is very extensive. GU: Solving the problem of low-cost trust — this is indeed a bottleneck for commercial adoption of blockchain. GUO: This is why I am very optimistic about the true value of blockchain technology in the future. GU: The seventh question: How to solve the problem of data storage when you are on the Ultrain chain? GUO: Storage space on the Ultrain chain is still very limited. When the data is stored, the cost is still high. At the same time, we have not encountered business scenarios that need large-scale and decentralized on-chain data storage. If there is a corresponding scenario, we have two solutions: 1. Distributed storage model 2. IPFS-based approach. We have corresponding technical reserves in both aspects. GU: The eighth question: What is the difference between trusted computing and cloud computing? Can it solve the current pain points in the cloud computing industry? The development of cloud computing is very mature, so how will Ultrain be differentiated from cloud computing? GUO: Cloud computing provides basic computing power that can be applied to a variety of different computing scenarios, while trusted computing provides what we call “open, transparent, immutable “ computing power, which is unique. The computing power available in existing cloud computing is completely different. Gu: Last question: Will cloud computing giants also introduce the concept of trusted computing? If they are involved in this field, what advantages does Ultrain have when competing with them. GUO: In actual implementation, cloud computing and trusted computing must be mixed. Most businesses run on cloud computing, and trusted computing is very expensive. It is only used in scenarios where trust needs to be established, such as asset confirmation. Cloud computing giants are already introducing the concept of trusted computing, and the BaaS services they provide (blockchain-as-a-service) are already trying to provide similar capabilities. The services provided by Ultrain are vastly different from the BaaS services provided by the cloud computing giant. Purely providing infrastructure. For example, you can purchase several Amazon cloud servers, deploy Ethereum on them, and then run a network of Ethereum composed of these machines. In this case, Ultrain is cooperating with cloud computing providers. Ultrain’s network can use Amazon servers, Microsoft’s Azure, Alibaba’s servers, and then integrate independent physical servers to form a huge computing network. Creating a chain to provide services. In this case, the giants need to understand that blockchains are built around trust. If the services are provided by Amazon, how do we ensure that the centralized nodes that Amazon controls does not change data on chain? This is actually technology-independent, because if you trust it you don’t need blockchain technology at all. You can achieve the same function with a distributed database, like mongo dB. It is precisely because it must be a decentralized network that computing nodes cannot be hosted by a company, which is the difference between Ultrain and cloud service giants in competition. At the same time, we have to mention the difference between the Ultrain business model and cloud computing service providers. The large cost of cloud computing service providers comes from server procurement, which requires heavy asset operation. Ultrain uses an asset-light operating model. The trusted computing nodes (that is, ordinary servers) in the Ultrain network are run by the public. The Ultrain network integrates CPU computing power of these servers to form a trusted computing service, and sells them to enterprises, and the enterprise pays service fees for purchased trust calculations. 80% of the fee is automatically transferred to the public node that provides the server, and 20% of the service fee is paid to Ultrain. This model was unimaginable in the past because trust could not be built, but we can do it with the help of blockchain technology. The service fee paid by the enterprise adopts a prepaid system. Service fees are made one year in advance. The usage fee paid by the enterprise to the Ultrain trusted calculation will be charged to the account automatically managed by a smart contract on the Ultrain main chain. The actual amount of computing power provided by each computer is automatically deducted from the corresponding amount in the corporate account and automatically transferred to the account of the computer owner. The entire process is automated and no one can change any process in between, including the Ultrain team. A: Can you organize a miner to rent to potential clients who have needs? GUO: This is similar to the 51% attack. For example, when Bitcoin was only a few dozen machines, it was easy to attack, but as the network size grows, the cost of such an attack skyrockets, reducing benefits to the attacker. The design of the Ultrain network is similar. We will make the code open source after 1000 servers are part of the network. A: It must cost a lot to fund the collaboration between Ultrain and carbon trading. GUO: The computing power is provided by the Ultrain network. Our customers only need to purchase based on their service demand, and costs are transparent to them. Real-time monitoring of our network operations is available on the official website. B: It was said that carbon emissions data is placed on the blockchain, but is only transaction data placed on the blockchain? Hello, Mr. Guo. Just now you gave an example of Ultrain’s adoption scenarios. Do you think the current traditional enterprises do not understand blockchain with enough insight? Are there many companies that need to have Ultrain’s trust computing services? Thank you. GUO: Many companies have a very deep understanding of the business model of blockchain transformation. Frankly speaking, many of us are students in this process, and we are grateful to different industries for letting us see the wide applications of blockchain. Today we presented the simple examples, but business needs are very clear. May I ask Guo, in the case of the boiler factory: how can trust before the data be chained be guaranteed? For example, the IoT equipment of the thermal mass spectrometer. Will the boiler plant find a way to modify the data it uploads to make a profit? GUO: You are right. The blockchain can’t solve all the problems. What we can solve is that device data cannot be tampered with after reaching the chain. The reliability of data from the device depends on the IoT device manufacturer to provide a complete solution. At the same time, the entire program needs to be reviewed by relevant national departments and industry associations, and these tasks are already underway. I would like to ask Guo Zong: at present, there are still many projects in the public chain industry. Compared with other public chain projects, what do you think is the competitive advantage of Ultrain? Thank you! GUO: I personally think that Ultrain has competitive advantages in several aspects. 1. We not only have obvious advantages in terms of performance, cost and privacy protection, but we are also the fastest public chain. Our mainnet has been live since January 1 2019 and we are officially providing commercial services. 2. We have a wealth of resources in business development. Many listed companies at home and abroad are in the process of technical verification and project implementation. 3. In terms of corporate services, we can serve enterprises with a complete set of solutions and consulting services, which is not available from any other public chain. 4. In terms of business model design, our economic system fully considers commercial operations. B: We mentioned the storage problem just now. In which scenarios od transactions need to be on chain and which are not? What are your requirements for the uplink data? This is a requirement for performance and storage. GUO: It depends on different scenarios.